US Oncology is a distributed network of more than 1300 physicians and a top-notch cancer research facility. 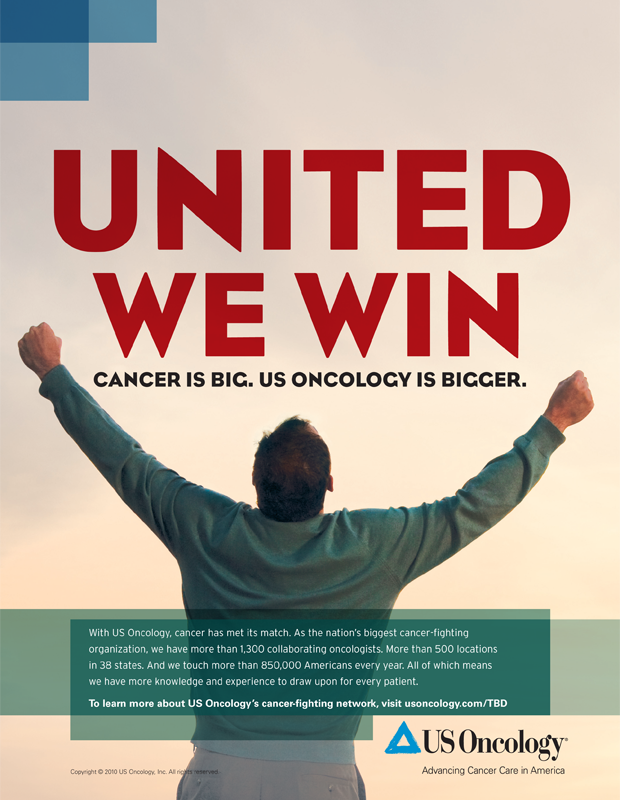 At the time of this campaign, US Oncology was already the world’s biggest cancer-fighting organization — yet their name never came up alongside Sloan-Kettering, MD Anderson or The Cleveland Clinic. These bold ads made a very big splash in The New York Times, Wall Street Journal, Time and dozens of other publications. We helped put US Oncology on the map for thoughtleaders, referring physicians and patients throughout the country. With US Oncology, cancer has met its match. As the nation’s biggest cancer-fighting organization, we have more than 1,300 collaborating oncologists. More than 500 locations in 38 states. And we touch more than 850,000 Americans every year. All of which means we have more knowledge and experience to draw upon for every patient.